Security Science integrates the multi-disciplined practice areas of security into a single structured body of knowledge, where each chapter takes an evidence-based approach to one of the core knowledge categories. The authors give practitioners and students the underlying scientific perspective based on robust underlying theories, principles, models or frameworks. Demonstrating the relationships and underlying concepts, they present an approach to each core security function within the context of both organizational security and homeland security. The book is unique in its application of the scientific method to the increasingly challenging tasks of preventing crime and foiling terrorist attacks. Incorporating the latest security theories and principles, it considers security from both a national and corporate perspective, applied at a strategic and tactical level. 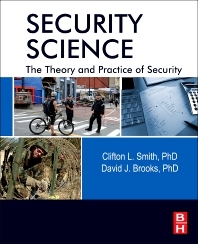 It provides a rational basis for complex decisions and begins the process of defining the emerging discipline of security science. Students in Security, Homeland Security, and Security Science programs in APAC, UK, Middle East and US; security professionals in government and corporate settings worldwide. Who is the facility manager? imaging, security knowledge and understanding, biometric imaging, and security education. evaluation, and perimeter technology testing. Security Vetting and Building Management System vulnerabilities.